A day we all turn to thoughts of love. Gifts to demonstrate our love. Time alone with loved ones. Mushy cards; or if we’re really fortunate, a personal love letter. Valentine’s Day can be a wonderful day, full of warm feelings and special times. But for some of us, it can be a disappointing day; a painful day. 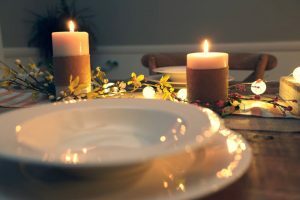 There’s no one to have a special dinner with. No one who tells us how special we are and how much they love us. We’re not getting mushy cards or love letters. Some of us love Valentine’s Day. Some of us don’t. Whichever camp you sit in, we all long to know we are loved; to hear the words, and feel we are cherished. 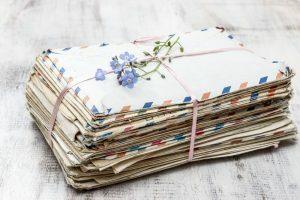 Dear Friend, this is a love letter; a love letter to you. It’s a love letter from the lover of our souls – the lover of your soul. Read on and discover how much you are loved by the One who gave it all … just for you. “Yes, I have loved you with an everlasting love; with unfailing love and kindness, I have drawn you to myself.” Jeremiah 31:3. That’s a love with some history; a love that has endured long-term, uninterrupted. 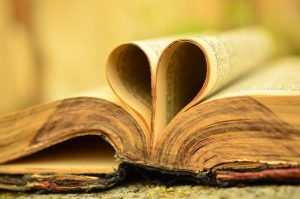 Read through the bible, from Genesis to Revelation, and you will discover the history of God’s love. You’ll witness how God has pursued us, across generations. That’s a love with a future; a love that will not come to an end. With that unfailing love, God gently and tenderly draws us in. There’s no coercion; no demands. Only kindness and perfect love. God has known us from the start. He’s always known us. Isn’t it reassuring to know that God has been around for every moment of our lives and has loved us through it all – the good and the bad? Rock solid. Not going anywhere. Wow! That’s commitment. I’ve never even had someone tattoo my name on their arm or anything. Imagine. 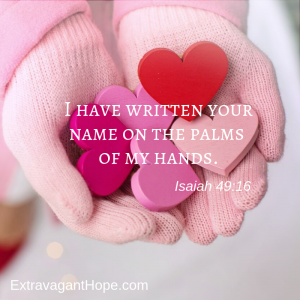 God has my name – your name – written (some translations say “engraved”) on the palms of his hands. That’s permanent. That’s intimate. He holds us close – in his hands. Commitment. Loyalty. Faithfulness. I can trust someone like that. If you’ve ever been betrayed, abandoned, disappointed, left or left out by people in your life, knowing that there is someone who will NEVER disappoint you, leave you, or abandon you is HUGE. I need this. We all need this. Most of the people we encounter would barely sacrifice their time or their favorite TV show or sporting event to spend time with us. God loved us – LOVED YOU – so much, that he was willing to sacrifice his own son in order to have a relationship with you. A lot of love on this earth comes with strings – conditions. Some people will love us for what they can get out of the relationship. They will love us if we do certain things or act a certain way. Or, they will love us if we change certain things about ourselves, first. But not God. God loves us because he loves us. And God loves us so much that he was willing to go to great lengths to rescue us while we were still sinners. In other words: before we cleaned up our act, no pound of flesh required, no strings attached. I’ve never met anyone else who could love like that. We are precious to God – just as children are precious to a parent. God calls us his own children. God cares for all of his creation, even tiny little sparrows. Even creatures that seem insignificant are valuable to God, and you are far more valuable to God than they are. People come and go from our lives. Circumstances change. We move. We change jobs. Our interests and activities change, and people move on – we move on – to other things and other people. It’s just a part of life. But sometimes it’s painful when the people we were so close to are no longer that close. It’s not like that with God. There’s nothing that will ever change the way God loves us; no circumstances that will cause God to move on to other things or other people – not even death. Nothing can separate us from God’s love. If you’ve ever had a failed relationship, or thought someone would love you forever – and then they didn’t – this one’s for you. God’s love doesn’t wane with the passing of time, or change like emotions. God’s love endures forever, no matter what. I needed to hear that. Maybe you did, too. I’m single, and have been for a long time. No mushy cards, date nights, or romantic dinners. 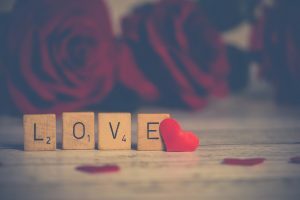 Valentine’s Day is a bit different for me – but still special. -Great friends whom I love and I know love me. -Wonderful kids – who buy me candy (and coffee) and rubber roses that light up, and remind me I’m loved. -Sweet grandchildren who give me kisses and tell me, “I love you Grammy” (while poking the jiggly flab on the back of my upper arms 🤣 ). But, there was a time when I wondered if anyone really loved me. I questioned my worth and whether anyone could love someone like me. Then I met the lover of my soul. I read the love letters He wrote. I learned that I was known and loved before I was even born and that I’m loved with an everlasting love by the One who will never leave me or abandon me. Wow. There’s just nothing that can compare to that kind of love. People may disappoint me or walk out of my life, but God never will. I learned that He loved me so much, He was willing to sacrifice his own Son just so He could have a relationship with me. Wow. I have infinite value to God. 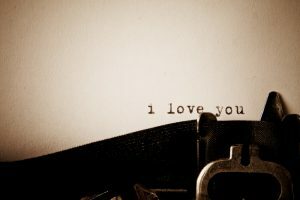 If you ever doubt that you are loved, read the love letters He’s written you. They’re in the bible. The history of His love, the depth of His commitment, your worth – how much he values you and cherishes you, the lengths He went to in order to have a relationship with you. It’s all there. Just for you. Maybe this Valentine’s Day, it’s time you discovered your greatest love. 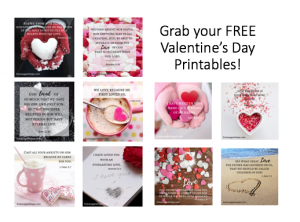 Because on Valentine’s Day we want you to remember the extravagant love God has for you, we made some beautiful FREE faith-filled printables. Frame them. Tuck them into your Valentine’s cards. Put them up around the house or at work. Use them as bookmarks. Or more. Click HERE and we’ll send them straight to your inbox. 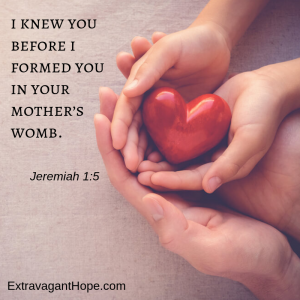 Visit us at Extravagant Hope for more faith filled posts.